Like many things, you have many choices when it comes to paddle boards. If you’re in the market for a paddle board, you should spend a few minutes and read this blog post as it could save you from making an incorrect purchase. 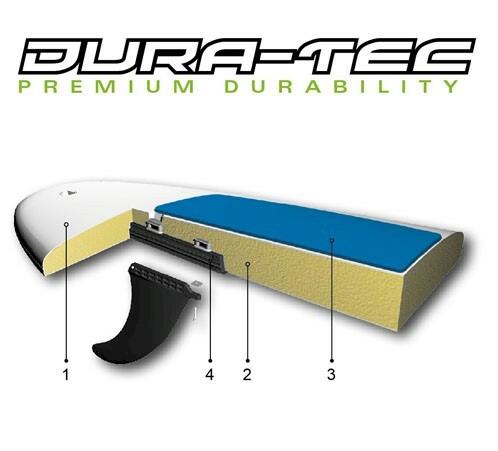 All Around – (Shown right) This is the most popular classification of paddle boards. All around boards are designed for balance, ease of use, and versatility. They normally have rocker, especially in the nose for waves but that’s where the similarity ends. All around boards can range between 29″ to 34″ wide, 9′ to 12′ long, and 3″ to 6″ wide. 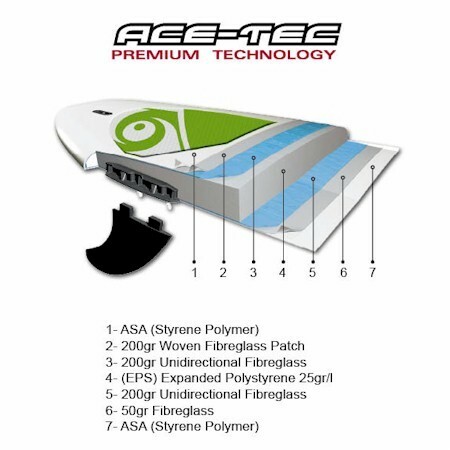 All around boards are made in many different constructions for different performance levels, shapes and prices. A wider board is better for balance but the trade off is it’s slower through the water. Length is determined by the weight of the person (or people) using it. Longer for heavier people. Construction determines performance. Rule of thumb is the stiffer and the lighter the board, the better it performs and handles but it raises the price. Touring– (Shown left) is the fastest growing paddle board category. After you’ve paddle boarded a while, you usually want more efficient glide and speed. Touring boards normally have a pointed nose and a squared off tail. They are normally between 11′ and 15′ long, and 24″ to 30″ width. Being narrower allows the board to slice through the water and waves instead of bouncing over. Touring boards normally have a longer water line which helps the board track straighter so you don’t have to switch from side to side as often. But because they are narrower, they are more difficult to balance when learning. Once again, the length, construction, and prices vary. Surf– (Shown right) Designed for ocean use and can be used for surfing waves. They tend to be shorter with more rocker and are not as stable as all around boards. This classification is popular for ocean use so you don’t see them in the Midwest. Racing boards- These elite boards can be up to 18′ long, are normally between 16″ and 24″ wide, and can weigh less than 10 lbs. They are usually pointed at both ends for speed. If you’re involved in racing, you want one. And if you have a racing board, you normally have another board for everyday use. Some racing boards can cost as much as $4000.00! 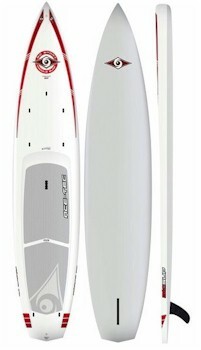 Paddle board construction is the main reason you see so many different prices. Plastic Boards – These boards normally are made liked a little kid’s cheap toy. While the price may be affordable, these boards are normally hollow yet heavy, sluggish and difficult to handle. 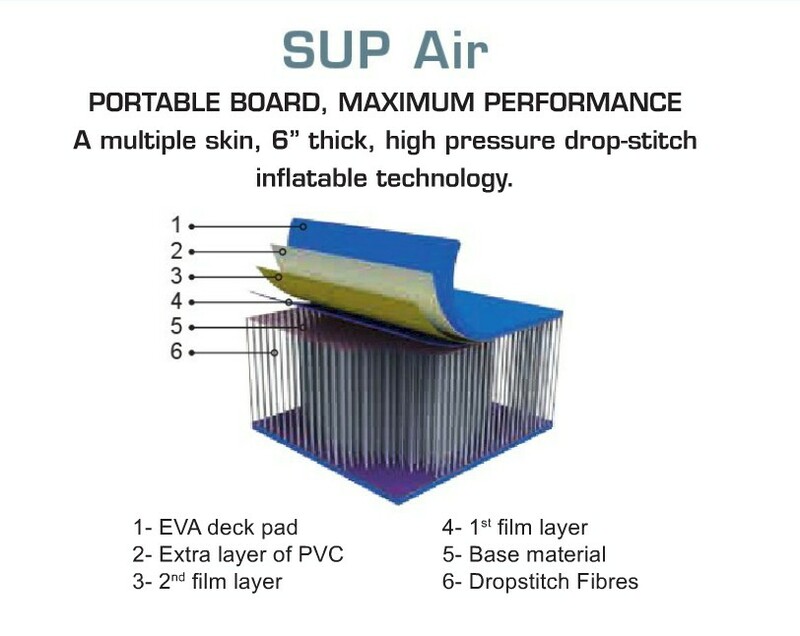 Inflatable Boards – This can be a good option for many people. 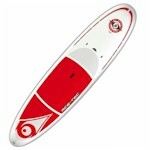 Inflatable boards are durable, transport easily, and have a soft deck. Soft top boards – The advantage of a full soft deck is great for kids to play on or for yoga. The disadvantage is the soft top damages easily and almost impossible to repair if damaged. Hard Boards – (See BIC DURA-TEC AND ACE-TEC) Hard boards offer the best in performance. They are stiff which allow the boards to plane over the water better than other constructions. Hard boards have many different constructions but as a rule, the stiffer the construction, the lighter in weight, the better the performance. But as you get stiffer and lighter, it gets more expensive. Watch out for the outer skin of the hull on hard boards. If it’s made with epoxy or gel coat, it could damage easily which could cost you in repair bills. Look for a more durable, outer skin like an ASA Styrene Polymer which performs the same as epoxy, but is more durable. You’ll be happy you did. Does length matter? 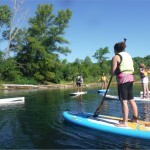 Paddle boards are available in different lengths. A general rule is everyone can use a longer board but lighter people benefit from a shorter board. The more weight you have on the board, the longer the board you need. If you are the only person using the board, then the proper length gives you the correct flotation while being easy to maneuver. Keep in mind, when choosing between sizes, it’s best to choose longer.